If you notice how social media is a bit dead right now, then you are observing the post-Qiyam syndrome. Last night the Islamic Society of Orange County aka Garden Grove Masjid (aka Muzzamils house), along with Muslim American Society hosted the first “All Masjid Qiyam Program” and the masjid was off the wall. I mean I was sitting next to folks like Imam Saddiq Safir (his son Imam Jihad Safir), Sheikh Alauddin el Bakri, Sheikh Abdul Jalil and board members from the large masjids from across five counties of Southern California. I was seeing folks I was active with in college from UCSD and folks who were family friends with my parents. If you don’t get what I am getting at its simply- the whose who of Southern California American Muslim community was present last night amongst the 2,000 plus people (which is the number in the prayer hall, but i hear there were just that many outside in the lobby and around the masjid complex!) that showed up there. My sincere and warmest appreciation to the organizers. (I hope the FBI felt the need to send forth their minions to such an auspicious gathering.) 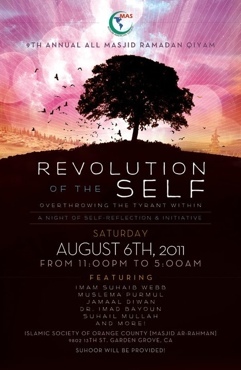 This event was not simple by any means, especially while fasting all day and staying up all night. But if you didnt go because of the “crowd” prospect than you were not the only one, I was actually hesitant to go because I don’t feel comfortable in carnival like environments such as the Qiyam potentially presented. I decided to put all that aside because of a girl….my SISTER!…and also because I realized while at the event, it’s about LOCATION, LOCATION, LOCATION. I wanted to make the most of it, so I found whatever means I could to get away from the places where people were talking and socializing. I was sitting right up front of the prayer hall. It was worth it! Like I mentioned before in my past reflections on Ramadan this year, Ramadan is all about a spiritual flu shot type of scenario. Its 30 days of intense spiritual immersion so you can face the rest of the year and have the means to survive to the next Ramadan opportunity. Ramadan is what you make out it. Shiekh Suhaib Webb said “If the doctor prescribes you medicines and you refuse to take it, then don’t blame the doctor for your illness or lack of recovery” so the same is true of Ramadan. Allah prescribed for us a month in which we can refuel our souls no matter how religious we are or the degree of religion we lack, his Mercy knows no bounds and this is especially true during Ramadan. So what is a Qiyam and furthermore what is a Qiyam program? We also can learn from the Quran, in Surah Furqan, that those who spend a portion of the night in prostration will be amongst the righteous and earn God’s mercy and benefit from his innumerable bounty. The crazy thing about Tahajjud prayers is that if you make a sincere intention to wake up and pray, but fail to wake up because you are drowsy, according to one hadith, the Prophet SAW says that you will have your intentions recorded as if you had woken up and prayed that night prayer (reported by Abu Darda). Thirmidhi reports that the reason for this status of the Tahajjud prayer lies in that this action and its timing are the closest that a servant comes to his Lord, where you “remember Allah the Exalted One at that time, then do so” in prayer, an inconvenience to your sleep. While its better to start with just praying one prayer on time, as Imam Wisam Sheriff suggested at the Qiyam last night, to come together at a opportunity like last nights is truly uplifting to the soul and can do wonders for you spirituality. So there are some more Qiyam programs coming up, if not organize one with your Youth Group in your community. Don’t miss out on the opportunity to maximize your reward during this month! Well put! I had no idea about getting Sawab for keeping the intention to pray Tahhajud, even if you don’t wake up. And the bit about not being able to wake up b/c you’ve sinned during the day.